We are the Party Wizards, powerful casters of magic, mixed drinks, and Mardi Gras beads. We’ve fought off the vicious armies of those sipping on the haterade, partied with ancient entities and are great defenders of the funk. We come here now, to make your party, birthday, or corporate event one for the ages. What you get: 1-4 of the most powerful Party Wizards in the Universe. We will come to your party, drink all of your beer, blast powerful wizard jams, and perform ancient and arcane magic tricks. Watch in awe as we produce shots our our sleeves, beer out of our hats, and generally f*ck up 90% of the magic tricks we attempt. Book us today! Not convinced? Here are some of our testimonials. We are the Party Wizards, powerful casters of magic, mixed drinks, and Mardi Gras beads. 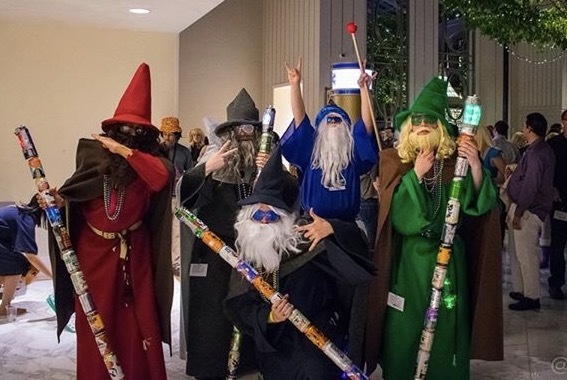 We are the holders of the unofficial world record of largest wizard party in human history. We’ve fought off the vicious armies of those sipping on the haterade, and are ancient defenders of the funk. We come here now, at the turn of the tide, to make your party, birthday, or corporate event one for the ages.